"This is one of my family's favorite hot dips. 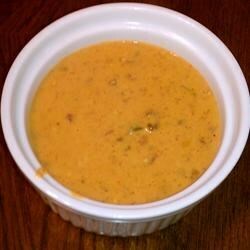 It contains cubed cheese, chili, cream of mushroom soup, ground pork, and diced tomatoes with green chile peppers (e.g. Rotel)." Place pork in a medium skillet. Cook over medium heat until evenly brown. Drain and set aside. In a crockpot or slow cooker over medium heat, combine the processed cheese food, diced tomatoes with green chile peppers, cream of mushroom soup, chili and cooked pork. Heat until all the cheese is melted. Serve with tortilla chips. A cheesy ranch dip kicked up with black olives and chiles! Yum! It is a little thin but so good! So good, I started to eat it by itself. Pretty darn good!! I would have liked it be have been a bit thicker...I added about a half cup of corn starch...it still could have been a bit thicker. Over all, the flavor was very good. I TOOK THIS TO GAME NIGHT AND EVERYONE LOVED IT. THIS IS ONE OF THE BEST DIPS EVER. This was great! I get rave reviews each time I prepare it. KWRight in Virginia.